"This is my favorite snack of all times. It's a little bit time consuming to make, but I usually make a big batch and freeze them. They can be deep-fried frozen. Serve them with spring roll sauce or sweet chile sauce and Thai ajad, pickled cucumber salad." Cover mung bean noodles with warm water and soak until soft, about 30 minutes. Cut into 1/2-inch pieces. Combine pork, bean sprouts, cabbage, mung bean noodles, egg, light soy sauce, sugar, and white pepper in a bowl. Mix well. Heat 1 tablespoon oil in a skillet over medium-high heat and cook garlic until fragrant, about 1 minute. Add pork mixture and stir-fry until pork is cooked through and looks somewhat dry, about 3 minutes. Add more soy sauce, sugar, or pepper to taste. Set aside to cool. Stir 1 tablespoon flour with some water to make a sticky paste for sealing the spring rolls. Lay 1 spring roll wrapper on a flat work surface with one of the corners facing you. Place a scant teaspoon of the cooled filling right below the middle of the wrap. Fold the corner facing you over the filling. Roll the filling up about a half turn. Fold the left and right sides in to create an envelope shape. Finish rolling up the spring roll tightly, sealing the top corner with a dab of the flour paste. Store unused wrappers and finished spring rolls under a moistened kitchen towel, to prevent them from drying out. Heat oil in a heavy pot over medium-low heat. 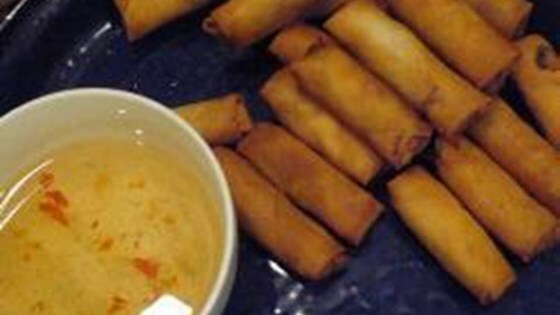 Fry spring rolls in batches until cooked through and golden brown, about 5 minutes. Drain on paper towels and serve immediately. Light, delicious Thai-infused Vietnamese fare!